U Vejvodu is a historic pub, beer hall and restaurant all rolled into one. 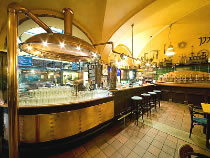 The rate at which the beer is served ensures visitors enjoy some of the freshest, frothiest Pilsner Urquell in Prague; served ice-cold of course. Set in the heart of Prague's Old Town, in a building dating from 1403, U Vejvodu is split over two levels. Downstairs is the main restaurant, which is in the style of a beer hall. Old photographs and memorabilia depicting the heyday of Czech brewing adorn the walls, and waiters in traditional attire serve hearty Czech cuisine. This is a fun place to eat, to soak up a typical Czech experience. The music carries a traditional Czech theme. Sometimes an accordion player will stroll around, and occasionally Old Bohemian bands put in a performance (groups can order a band by special request). Upstairs has more of a pub style atmosphere and attracts a younger set. The music is more modern and upbeat, and Prague locals mix with couples, hen nights, stag parties, indeed all types of groups, everyone blending in to create a lively, warm atmosphere. Some people just come for drinks, others book a table to eat (reservations are important on busy nights), then stay on for drinks afterwards. We recommend trying the beer here because U Vejvodu is one of only a handful of places to offer tank Pilsner Urquell beer; the beer is delivered from the brewery in vast quantities by a temperature controlled, airtight tanker lorry. Taste the difference! There are also kegged beers to choose from, both light and dark, as well as wines, Champagne, spirits and cocktails. U Vejvodu is a very popular venue. On a good night when the atmosphere is at its best, you may find yourself staying longer than you envisaged. U Vejvodu appeals to all age groups and for a variety of occasions, from Prague stag nights and hen parties, to birthday celebrations and business dinners. Advance reservations are essential.